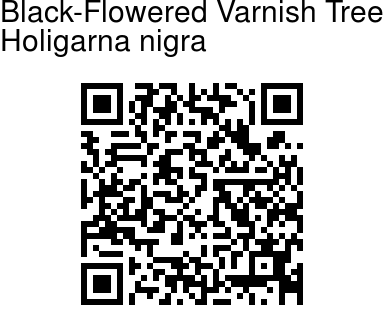 Black-Flowered Varnish Tree is a tree, up to 30 m high, bark 5-6 mm thick, grey, smooth; exudation black. Leaves are simple, alternate, estipulate; leaf-stalk 20-25 mm long, stout, hairless; spur 2 or 4, falling off; blade 7.5-15 x 3.7-5 cm, spoon-shaped, not suddenly broadened above the base, base wedge-shaped, tip blunt or notched, margin entire, dark green, hairless, leathery; lateral nerves 6-9 pairs, parallel, prominent; intercostae netveined, prominent. 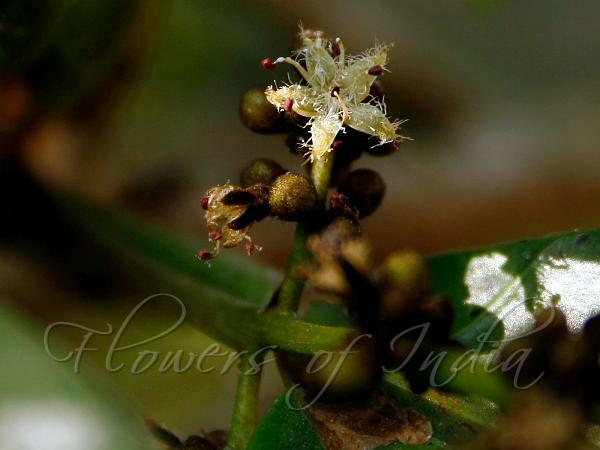 Flowers are polygamous, purple-white, in at branch-ends and in leaf-axils dark purple brown woolly racemes and panicle of 30.5 cm long in males and 7.5 cm long in female flowers; flower-stalks stout; calyx hairy, cup-shaped, lobes 5; petals 5, white within, clothed with white hairs; stamens 5, filaments white, anthers black; disc 5 lobed; ovary inferior, obconic, woolly, 1-celled; styles 3, recurved; stigma capitate. Fruit is a drupe, 4 x 1.5 cm, obovoid, hairless. Black-Flowered Varnish Tree is endemic to Western Ghats. Flowering: March-May.